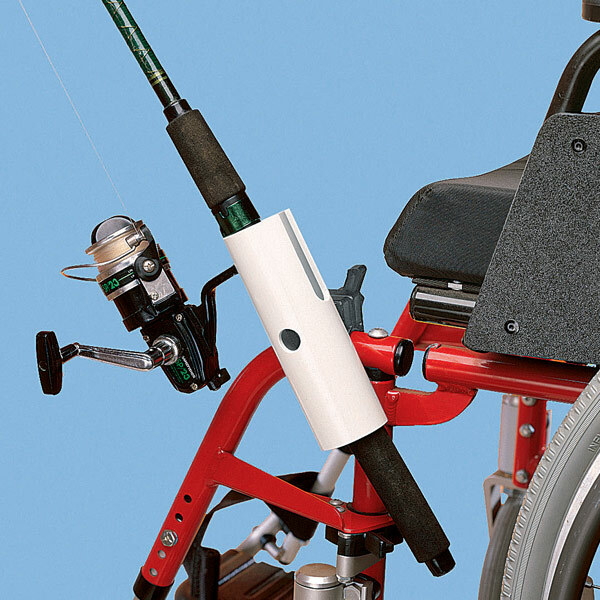 Adaptable to any tubular frame 7/8 to 1-1/8"
This wheelchair accessory holds the pole so you don't have to! The clamp-on fishing pole holder keeps a good grip on the pole while making the reel available for one-handed operation. The mobility accessory pole can be easily removed from the holder. The wheelchair aid has plastic clamp and a large easy-to-tighten lever knob and is adaptable to any tubular frame 7/8 to 1-1/8 inches (2.2 - 2.86 cm) diameter. The holder also fits on lawn chairs and beach chairs.